On Monday, January 28, as a powerful snowstorm pounded Mt. Pleasant, Central Michigan University cancelled that day's operations at 9:00 am. Two days later, because of temperatures and wind chill values well below zero degrees Fahrenheit, CMU shuttered again for two days. These campus closures sparked curiosity around the campus – has Central cancelled classes for multiple days at a time in the past? In our memories here at the Clarke, we couldn’t definitively remember any such occasions. But with over 100 years of campus newspapers at our disposal, we knew we could find the answer! 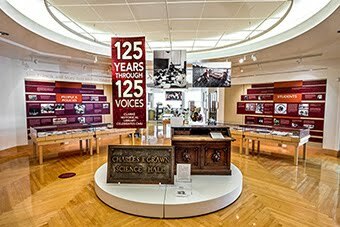 Immediately, we headed to CMUHistory.cmich.edu for our journey back in time. We set our eyes first on 2014, remembering the last polar vortex that chilled Mt. Pleasant to the bone. 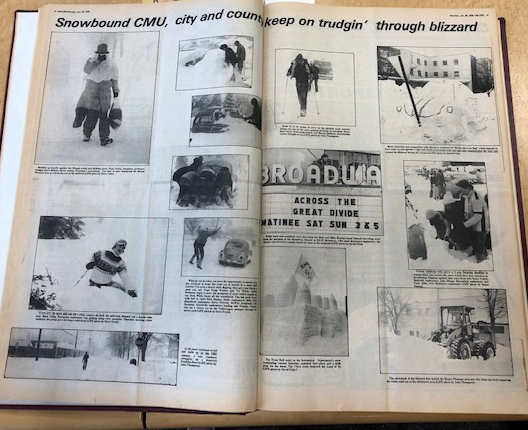 We found that CMU closed twice that winter: January 28 due to the bitter cold, and the evening of February 21 due to snow. Central had closed multiple days in 2014, although not consecutively. We were early in our journey, so it was no surprise that we didn't have a positive answer, yet. The next stop for our time machine was February 2011. That month, Central cancelled classes twice. But again, not consecutively. On February 2, a winter storm closed classes all day. On February 21, all morning classes were delayed due to poor road conditions. The search would have to continue to find out if Mother Nature had previously wreaked havoc in Mt. Pleasant à la January 2019. 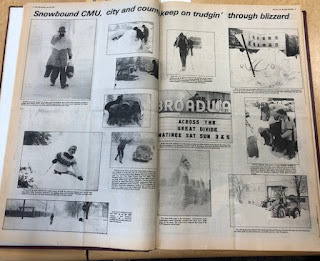 As our time machine cruised through the 2000s, the 1990s, and the 1980s, we found a couple single snow days – February 16, 2006 and December 4, 1990 – but no major shutdowns. Like any trip down snow-covered roads, we were diverted off our course. In this case, we took a detour to see some fun artifacts of the past, like an ad from 1990 for an IBM Personal System/2 computer with 1 megabyte of memory and 30 megabytes of hard disk storage for the tidy sum of $1,649! Or you could swing by WhereHouse records to buy 1995’s hottest soundtrack, Men In Black, for $8.99…on cassette! But we quickly moved through the detour and got back on the path to solving this campus closure curiosity. As we moved beyond 1980, we came to January 25-27, 1978. For those of a certain age who lived in Michigan at the time, they know exactly what we are about to describe. For those who were not yet alive, they, too, know exactly what we are about to describe, thanks to a relative, friend, neighbor, teacher, or some random person in the grocery store on a snowy day – because anyone who survived it can't seem to go a winter without mentioning... “the Great Blizzard of 1978.” And there is a reason people who lived through it remember it well. 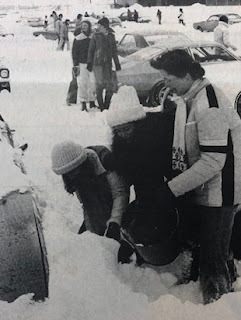 Considered one of the worst winter storms in US history, Mother Nature and her friend Old Man Winter slammed the Great Lakes region with multiple feet of snow and wind chill values that plunged below -50 degrees F. As a result, schools, universities, businesses, and municipalities throughout Michigan cancelled operations. Governor Milliken declared a state of emergency. Traverse City was declared "unofficially closed." For two days, Thursday, January 26 and Friday, January 27, CMU told students, faculty, and non-essential staff to stay away from campus. With classes cancelled, students managed to keep busy, thanks in part to the Intramural Department at CMU. The IM staff hosted a disco dance night with over 1,500 attendees in the Rose Arena. They also sponsored a snow sculpture contest for the residence halls; Trout Hall won with a Wizard-of-Oz-themed sculpture. Off-campus, some enterprising businesses – specifically Tom’s Foolery and the Wayside, capitalized on students looking for a way to pass the time with all of their regular curricular engagements removed from the agenda. The Wayside, which opened at 2:00 pm on Thursday, reported over 500 people inside by 2:30 pm. We finally answered the question of whether there was a previous instance of a consecutive-day closure in CMU’s history. But the Clarke staff didn’t stop there (our time machines can handle a lot more than those 1990 IBM PS/2’s with 1 MB of RAM). As we kept heading back in time, we came across another winter-related, although not weather-related, closure. This one was much longer than any other on record. 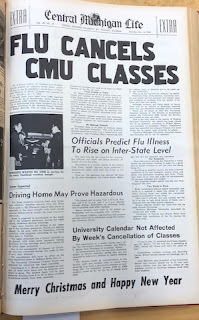 Fifty years ago, in December 1968 and January 1969, Central officially closed down for three weeks because of an influenza outbreak. Back in 1968, the fall semester started on September 14 and ended on January 24 with a 2-week break, from December 21 until January 6. 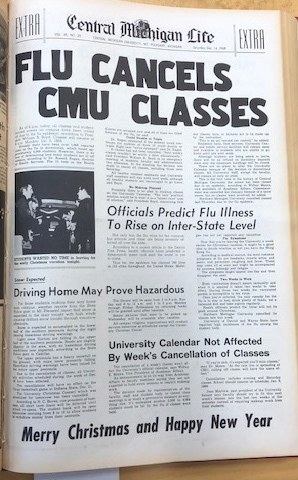 The flu epidemic, which killed over 30,000 people in the US and approximately one million worldwide, caused the CMU winter break to start one week early. By Saturday, December 14, over 1,000 of the 6,000 students who lived in campus residence halls had already reported being ill. In response to the health emergency, and for the safety of everyone at Central, university administrators cancelled all operations from December 14 until January 6. Although students only missed one week of classes, the official closure lasted over three weeks, making this the longest emergency closure in Central’s history.